Jordan Hufty was overcome with emotion just moments after winning the 566-strong Event #1: $565 Casino Employees No-Limit Hold'em for $61,909. Hufty defeated Jodie Sanders in a grueling heads-up match that lasted nearly four hours. It was fitting these two players were left standing when all the pieces fell into place, as they were the chip leaders throughout the entire day. After embracing his friends on the rail, Hufty took a moment to himself at the feature table on the main stage and was seen wiping tears from his eyes. When asked about the emotion of winning a World Seris of Poker gold bracelet, Hufty struggled to find the right words. "I've thought about this every day for the last 15 years and for it to actually happen is just unbelievable." The Aria poker dealer and floorman was quick to credit a couple of his close friends for his success. "I moved from Michigan to Las Vegas with these two guys and none of this would be possible without them." Hufty says 95% of his poker is played online, 4% in live cash games, and maybe he finds time for 1% in live tournaments. Coming into today, he only had $1,900 in career live tournament earnings but that number will be growing exponentially now. "I have a passion for poker, it's just something you can't explain. It's nice that this happened so early in the series so I will probably fire a few more events here and there." At the start of the day, Hufty felt fairly confident coming in as one of the largest stacks and said he just needed to stick to his plan. "I felt confident and I knew I just needed to avoid making mistakes and capitalize on my opponent's mistakes. When you are 70 big blinds deep heads-up, it can be a grind, but I never lost focus." Some players will often get nervous being on the big stage and under the lights for the first time, but that didn't seem to faze Hufty. "I've dealt a lot of nosebleed games and even been at this table on Poker After Dark before, just on the other side of it. I didn't feel out of place on the big stage like I thought I would." Hufty mentioned he is going to take a couple of days off to celebrate and some tequila shots might be on tap for the weekend. In what has become the customary opening event of the World Series of Poker, the Casino Employees event got the summer started with another great turnout. Late registration remained open for 12 levels and a total of 566 entries were accounted for. This unique tournament doesn't necessarily attract the big names in the poker world, but rather it brings the gaming industry together for a game that they all love. Some familiar faces to take to the felt included former gold bracelet winners Mike Majerus, Chad Holloway, Jon Friedberg, and defending champion Bryan Hollis. 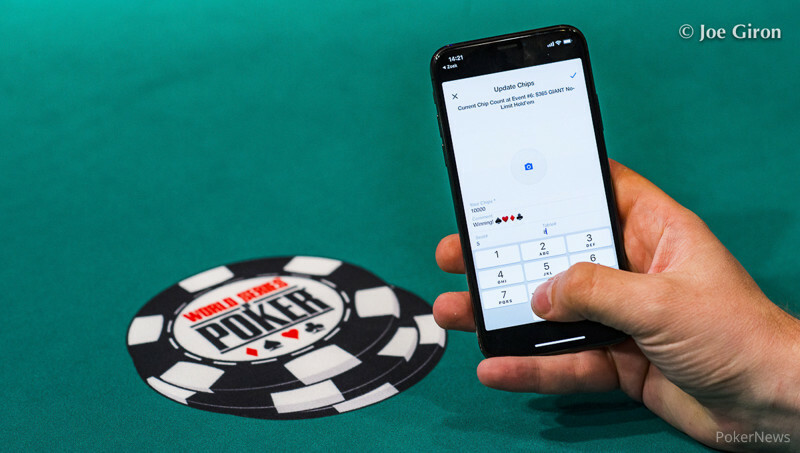 WSOP social media phenom Kevin Mathers took a seat along with PokerNews employees Simkha Blank and Milko van Winden, none of whom were able to spin up a stack to make the money. It wasn't long after the dinner break on Day 1 when the money bubble burst with Jason Bardol and Ryan Side busting on the same hand. The two players would split the min-cash of $837 and the remaining 84 players rejoiced in excitement. There was a total of $283,000 up for grabs and the eliminations started to come fast and furiously towards the end of Day 1. A few notables to make the money included Jon Friedberg (81st Place - $862), Ty Stewart (52nd Place - $1,085), Isaac Hanson (38th Place - $1,227), Johnny Gagelonia (33rd Place - $1,418), and former bracelet winner Dieter Dechant (17th Place - $2,018). After a full 20 levels were played on Day 1, there were just 13 players still standing with a shot at the title. The action got off to a quick start on Day 2 with double knockouts happening on multiple occasions. The official final table was down to just eight players before the first level reached its end. Not long after that, Skyler Yeaton, Thomas Yenowine, Tom Booker, Won Kim, and Zachary Seymour all hit the rail in quick succession within one hour. It looked as though it would be a quick final table but the remaining three players were still fairly deep. Three-handed play lasted for nearly 90 minutes with Hufty continuously holding the chip lead. Katie Kopp was on the short stack but she put up a good fight before eventually running into Hufty's pocket aces. That set the stage for the two chip leaders to battle in an epic heads-up duel. Hufty started out strong and worked his way towards the two million chip mark before Sanders started to wrestle it away. The chips swung back and forth for hours with Sanders briefly claiming the lead for a hand or two. Hufty was clearly the more aggressive of the pair, and he eventually gathered too much momentum for Sanders to overcome. After nearly four hours of heads-up action, Sanders got all of his chips in the middle with pocket threes and was called by the king-queen of Hufty. The board looked safe for a Sanders double up, but when the dealer placed the king on the river, Hufty broke down after capturing his first WSOP gold bracelet. That brings an end to another event inside the Rio All-Suite Hotel and Casino for the PokerNews live reporting team. There is still plenty of action in the surrounding rooms that will wrap up later today and continue tomorrow. 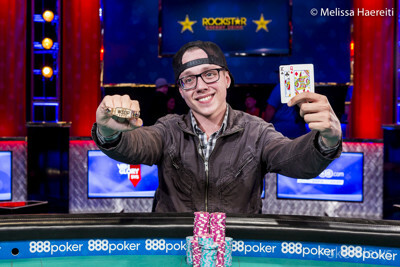 Hand #190: Jordan Hufty opened with a raise to 80,000. Jodie Sanders looked at his cards then moved all in. Hufty asked for a count and the dealer revealed that it was 720,000. Hufty thought a few more seconds then put in the chips to call. The flop came safe for Sanders when the ran off. The the turn was also a safe card. However, Sanders couldn't fade the on the river and that would spell the end for him. With that, Hufty made a pair of kings and locked up the tournament. Sanders takes home $38,246 for his second-place finish. Hufty takes down the tournament and collects $61,909 for his win as well as his first World Series of Poker gold bracelet. Hand #188: Jodie Sanders got a walk in the big blind. Hand #189: Jodie Sanders raised on the button to 80,000. Jordan Hufty moved all in with a covering stack and Sanders folded after giving it some thought. Hand #183: Jodie Sanders opened to 120,000 on the button and Jordan Hufty folded his big blind. Hand #184: Hufty raised to 80,000 on the button and Sanders announced all in which got a quick fold from Hufty. Hand #185: Sanders bumped it up to 105,000 and Hufty took his turn to move all of his chips in the middle. Sanders thought for a moment but then elected to lay his hand down. Hand #186: Hufty opened to 80,000 and Sanders defended his big blind. The flop fell and both players checked to the on the turn. Sanders led out for 125,000 and Hufty mucked his cards. Hand #187: Sanders folded his button and Hufty received a walk in the big blind. Hand #178: From the button, Jordan Hufty opened to 80,000. Jodie Sanders moved all in over the top and that ended the matter as Hufty quickly folded. Hand #179: Sanders limped in on the button and Hufty checked his option in the big. 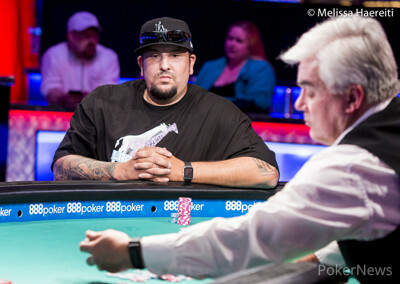 The flop came down and Hufty checked, then folded to a bet of 75,000 from Sanders. Hand #180: Hufty opened with a raise to 80,000 on the button and Sanders called. The flop came down and Sanders checked, then folded to a bet of 40,000 from Hufty. Hand #181: Hufty received a walk in the big blind. Hand #182: Sanders received a walk in the big blind. Players will now be taking a 60-minute dinner break and will return at roughly 8 p.m.
Hand #171: Jodie Sanders just called on the button and Jordan Hufty raised to 90,000 which prompted a fold from Sanders. Hand #172: Hufty folded his button and Sanders received a walk. Hand #173: Sanders raised to 60,000 on the button and Hufty made the call. The flop came and Hufty checked to Sanders who continued for 40,000. Hufty check-raised to 155,000 and Sanders called. The turn was the and Hufty slid in a bet of 325,000, forcing Sanders to muck his cards. Hand #174: Hufty opened to 60,000 and Sanders folded. Hand #175: Sanders raised to 60,000 and Hufty mucked his hand. Hand #176: Hufty raised to 60,000 on the button and Sanders defended his big blind. The flop fell and Sanders check-folded to a bet of 65,000 from Hufty. Hand #177: Sanders bumped it up to 60,000 and Hufty called from the big blind. Both players checked the entire way on a board reading and Hufty tabled to rake in another pot. Hand #166: Jordan Hufty opened to 60,000 from the button and Jodie Sanders folded his big blind. Hand #167: Sanders opened from the button to 60,000 and Hufty called from the big blind. The flop was and Hufty check-folded to a bet of 40,000 from Sanders. Hand #168: Hufty opened to 60,000 on the button and Sanders called. On the flop, Sanders checked, then called a bet of 60,000 from Hufty. The turn was the and Sanders checked again. Hufty put out a big bet of 240,000 and this time Sanders folded. Hand #169: Sanders opened with a raise to 70,000 from the button and Hufty called. Both players checked on the flop to see the on the turn. There, Hufty led out with a bet of 65,000 and Sanders called. Both players checked on the river. Hufty showed his but it was no good as Sanders flopped better with and he took down the pot. Hand #170: Hufty opened with a raise to 60,000. Sanders called. The flop was and both players checked. On the turn, Sanders led with a bet of 70,000 and that earned him the pot.